Samurai Sentai Shinkenger is 33rd entry in the long- running Super Sentai series. Beginning with Mighty Morphin' Power Rangers, Saban would use the footage from the previous year’s Super Sentai as the basis for that year’s Power Rangers. The rights to the series were eventually sold to Disney. 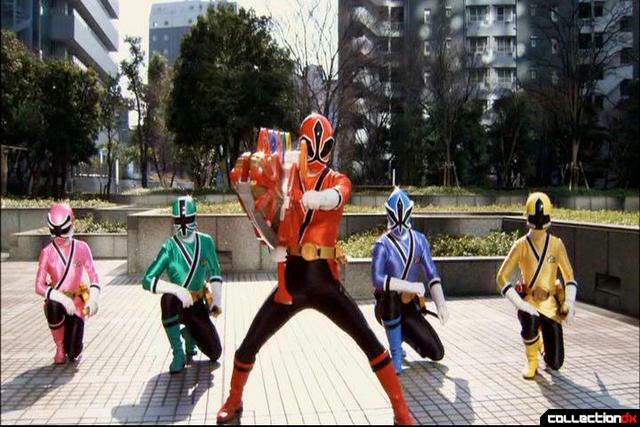 During the year that Disney would have adapted Shinkenger into Power Rangers, they opted instead to re-air the original Mighty Morphin’ Power Rangers series (probably due to the heavy Samurai/Japanese motif of Shinkenger). The following year, Saban bought the rights for Power Rangers back from Disney. Saban decided to kick off their re-acquisition of the brand they created by adapting the show that Disney had passed over: Shinkenger. Saban’s decision paid off; Power Rangers Samurai has been a big hit. The toy line which originally received a very limited release, is now available at just about every major retailer; making Power Rangers a heavy hitter in the toy-aisles once again. Power Rangers Samurai is even returning to TV this year with a second season (which I believe makes Shinkenger the only Super Sentai to ever be adapted into multiple season). Thanks to the massive popularity of Power Rangers Samurai, Toys"R"Us struck a deal to carry the S.H. Figuarts Shinken Red and Shinken Gold. Which is thought was pretty cool, because it is not every day you can walk in to your local Toys"R"Us and pick up a S.H. Figuarts figure. So I bought a Shinken Red, the leader of the Shinkenger, to support Toys"R"Us for making them available to us here in the States and also because of my affinity for Shinkenger. The box is the usual S.H. Figuarts fare. The box for the American release has been slapped with the mandatory choking hazard warning, stating that this toy is not meant for kids under the age of three. Another difference with the American release of this figure is that it comes with English instructions, which let's you know which hands are meant for each of the attachments (that is if you can’t figure it out on your own). The S.H. Figuarts Shinken Red really captures the essence of the suit. It even has seams in the back of the figure, as they appear on the back of the suit. The helmet looks as it would in the show, complete with air slits on the side. Shinken Red comes with his handy Shinkenmaru, complete with detachable Hidden Disc. I was a bit disappointed that Bandai didn’t allow the disc to spin on the sword; that would have been a nice touch, since in the show the power of the Shinkenmaru is enhanced by spinning the Hidden Disc on the sword. Shinken Red’s Shinkenmaru transforms into the Rekka Daizantou, a huge zanbatou-style sword. The Rekka Daizantou also comes the Hidden Disc attached to it; in this case the Hidden Disc does spin. Although the Rekka Daizantou is an awesome sword, I think Bandai missed another opportunity to excel in creating a show-accurate weapon. For the finisher move in the show, the Rekka Daizantou could go into Ozutsu Mode, turning the sword into canon that the five of the Shinkengers would load their Hidden Discs into and blast the enemy with. A transforming Rekka Daizantou would have been another nice addition to this figure; it would have made a great incentive for those the fans willing to buy the other 4 main Shinkengers, which were all pricey Tamashii Web exclusives. Bandai also included Shinken Red’s Shodophone in brush mode, which the Shinkengers use to create attacks with their Mojikara. Shinken Red also comes with trusty Origami: Shishi (Lion). In the show , when Shinken Red needs to fight off the giant Gedoushu, Shishi Origami becomes a giant mecha with the help of Shinken Red. Hey... Psst…. That was last season's mecha summoning sequence. There is a separate Shishi Origami in symbol mode. Shinken Red has a great range of motion, as one would expect from the S.H. Figuarts line, for all your posing needs. He is even sporting a swivel/ball joint combination connection for attaching the legs to the hip, which allows the legs to extend more. My biggest complaint about this release, besides the couple of things that Bandai could have done better, would have to be that the joints for the feet and the leg connections to the hip were a bit loose. This made it incrementally harder to pose the figure without it toppling over, as I began to split his legs apart. This is a problem that plagues only my Shinken Red, as the Shinken Gold that I bought has nice, tight joints. All around, the S.H. Figuarts Shinken Red is a decent figure. For the asking price though, I felt that Bandai could have put a little bit more effort into it. After playing with the S.H. Figuarts Kamen Rider Knight, which was packed full of extras and really showed that Bandai took the time to give customers a lot of bang for their buck; Shinken Red felt a little lacking in the value department. I love my ShinkenGold. One of my concerns with Red was the shoulder pieces being a darker red than the rest. But other than that it's awesome. If you haven't picked up any of the Gokaiger Figuarts, I highly recommend them. They took any nitpicks I had about the Shinkengers and fixed them. They even have bicep swivels. BICEP SWIVELS! Ok, it's not THAT extravagant, but I didn't realize how great they were until my figures didn't have them. Nice figure! Together with Jetman, Shinkenger is my favorite Super Sentai show, and if Bandai hadn't made the other Shinkengers Figuarts web exclusives, I would likely get all of them. Nevertheless, this is one solid release. It's good to see that he can pose well with the Rekka Daizantou, I was afraid it would be too heavy for the figure to even hold. Luiz- Jetman and Shinkeger are also my top two Super Sentai. I would kill for Bandai to make a S.H. Figuarts Jetman set ( or just pay the Tamashii Web exclusive prices). As for the Rekka Daizantou, it is a fairly heavy weapon. You are going to have to work on balancing the weight of the figure and the Rekka in order to for Shinken Red to hold a pose. Gokaiger surprised me. It's one of my favorite shows now. My two favorite characters were Don and Luka, so I had to get their Figuarts. Despite Luka's pricey-ness, she's actually completely worth it. She comes with a LOT of accessories, and the Gokai Darin is packaged inside the box. I agree. I read your review and I saw that Gokai Yellow's release comes jam-packed wit stuff. That helps alleviate the fact that she is more expensive. Too bad she is sold out now. I can imagine the prices are pretty high on the secondary market. I might pick her up if I can find her for a good price. Yeah. I'm sure you'll be able to grab her fairly easily. "Yeah. I'm sure you'll be able to grab her fairly easily." Haha. Yea she will. I might be cheaper to grab Ahim. We're still talking about toys, right? I think packaging him is "Shinken Red" for the American release was a mistake.